Targets that make assumptions about future breakthroughs in technology can be costly and cause greater problems than the ones they solve. The report outlined a plan of how to achieve its recommendations. The world must invest $2.4 trillion – about 2.8% of global GDP in 2018 – in clean energy every year between 2016 and 2035 and reduce coal-fired power generation to more or less zero by 2050. According to Bloomberg New Energy Finance estimates, this is about seven times the amount invested globally in renewables in 2017. Needless to say, globally we are already far behind these targets. A Paris Agreement commitment by developed countries in 2015 to provide $100bn/year by 2020 to help developing countries to tackle climate change is nowhere being achieved. How then can we rely on achieving the $2.4 trillion investment identified by IPCC? An increasing number of countries have been committing, or are considering to commit, to zero, net-zero or near-zero emissions by 2050. Sweden has already legislated to achieve net-zero emissions by 2045. The current UK target is a reduction of 80% of emissions by 2050 based on 1990 levels, but it is now considering a future with zero GHG emissions. The government sought late last year guidance from the Committee on Climate Change (CCC) about how and when to make this leap. Climate minister, Claire Perry, said that for her, “the constant question is what is the cost and who's going to bear that, both in the UK and in the global economy,” adding "the question is: what does government need to do, where can the private sector come in, and what technologies will come through?" But the CCC, which is an independent body set up to advise the government on emissions targets, is warning the UK will drift further away from its goal unless new policies are introduced soon. The EU is also considering setting up targets to achieve net-zero emissions by 2050, but it recognises that achieving this would require “significant policy intervention and investment.” Even though ten member states are keen to press on with this, others, including Germany and Poland, are not. Europe is responsible for only 10% of global emissions. There is concern that an expensive energy transition would make no sense if the rest of the world does not follow suit. But is it achievable in the first place, or is it based on fact or leaps of faith? The technological developments required to enable this to happen might not become available affordably, meaning that plans might be doomed to fail. Is achieving zero emissions by 2050 achievable? Based on government policies, technology and social preferences continuing to evolve in a manner and speed seen over the recent past, as assumed in BP’s ‘evolving transition’ (ET) scenario (Figure 1), the answer is yes. 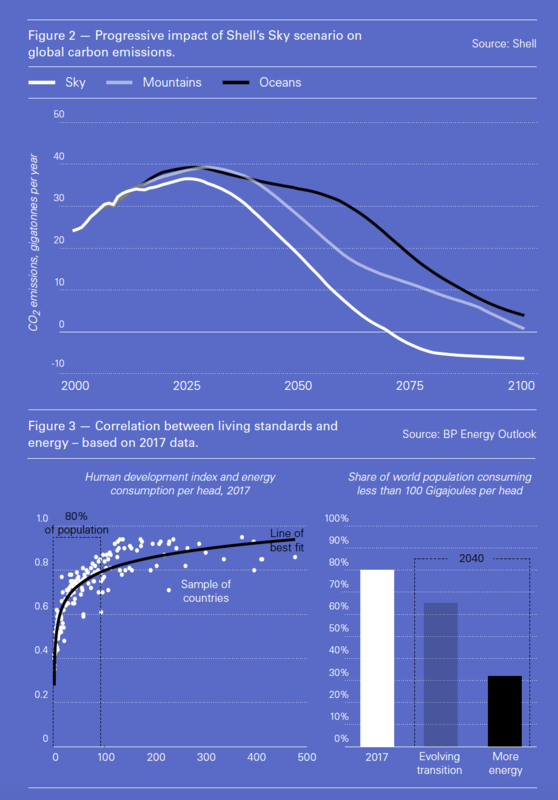 To achieve zero emissions by 2050 would require leaps - step changes – in technology, even more than envisaged in BP’s ‘rapid energy transition’ (RT) scenario. And this needs to be done while energy supply is available on demand and remains reliable and affordable. 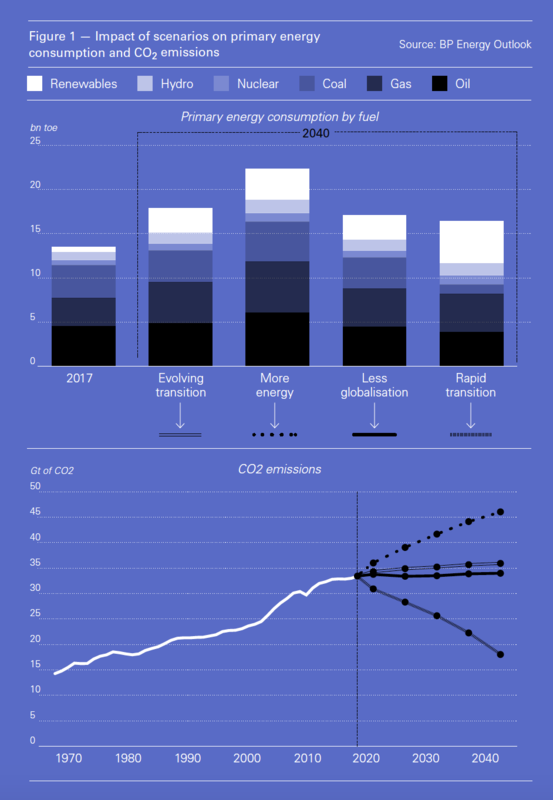 In the UK a joint report between the Royal Academy of Engineering and the Royal Society lays out a vision to make the UK carbon neutral by 2050, but concludes that “only a quarter of this could be achieved with relatively simple ready-to-go methods … Other methods will need much more technological development and investment before they can be used on the required scale.” Can anybody say how this will be funded and when it will happen with any certainty? And yet, there is growing demand that oil and gas companies stop investing in and developing new oil and gas fields now. An example is Mexico. It set ambitious GHG emission reduction targets – 30% against a business-as-usual baseline by 2020 and 50% by 2050 against 2000 levels. However, reality has been different. During the last 20 years both energy use and emissions have grown, far exceeding these targets. Lomborg examines the 2015 Paris climate agreement as an example of the challenge. Countries made grandiose commitments to keep the global increase in temperature well below 2 °C above pre-industrial levels. But even after aggregating all ‘national determined contributions’ (NDCs) to limit climate change, a UN Framework Convention on Climate Change (FCCC) report concludes that the NDCs will not get anywhere near this target. A paper by the London School of Economics (LSE) shows that only 17 countries are actually meeting their NDC commitments, and in most cases that is because of the modesty of their promises. The paper concludes that the lack of targets and inconsistencies create doubts about the likelihood of realising the goals of the Paris Agreement. The switch to renewables in the electricity sector is rapid, but the sector accounts only for a fifth of global primary energy. Extending renewables progress in the electricity sector into other areas such as heat, transportation, industry and land management appears to be a challenge too far. Climate change dominates energy policy development, often creating the impression that both oil and gas will soon be eliminated from the energy mix, with energy needs covered exclusively by renewables and clean fuels. Already campaigners and activists are calling for divestment from the oil and gas sectors now. There are also calls on social media to treat oil and gas in the same way as tobacco. Litigation is increasing. A global movement of school-kids is now being mobilised to heighten attention to climate change. BP has also agreed to report on measures it takes to prepare for a lower carbon world. And this is crux of the matter. Transition to low emissions, and eventually elimination of emissions, must happen, but must also happen in an orderly way – by all. And the path to get there must be well understood and must also be achievable, not just based on assumptions that technologies will simply become available when needed. Unfortunately governments cannot assume that the can-opener will be there when needed. How to get there, while providing the levels of energy the world needs on demand, affordably and reliably, still needs to be worked out. In the meanwhile the oil companies see it as their responsibility to continue providing the energy their customers and the world need for as long as required. They cannot dictate to their customers what form of energy to use. Energy firms are quite willing to work with governments to achieve this. BP’s Dudley summed this up when he said “we can do this even faster and more efficiently with clearer, smarter policy signals from governments.” And it must be done by all, not just in Europe, but also Asia, where most future growth in energy demand will take place. It would require worldwide co-ordinated and concerted action, involving all major economies, at a scale never seen before. But how practical is this and how can it be achieved? Shell’s SKY scenario, reported in NGW, describes a pathway to reach net-zero emissions by 2070 – not by 2050. Even under Shell’s ‘oceans’ scenario, emissions will still be about two-thirds today’s levels by 2050. Sky begins with the current structure of economic sectors and government policies and the capacity for change that exists now. For the next ten years it assumes very aggressive, but plausible, capacity-building and ratcheting up policy commitments in line with the Paris Agreement. Beyond that time-frame, there are great uncertainties about how policies and technology may be developed and implemented globally. It is an approach grounded in the current reality of the energy system, but it is then combined with a specific long-term goal over a reasonable and realistic transition period. In terms of reducing and eventually achieving net-zero energy emissions, what Shell proposes requires new government policies, changing peoples’ mindset, carbon pricing, electrification, energy storage at scale and time, carbon capture and storage, reforestation and step changes in technology – much the same as IPCC has recommended, but responding to technological change as it evolves, rather than assuming that specific types of new technology will just happen. But, depending on technological developments, by 2050 and even by 2100 the world may still need fossil fuels despite the massive increase in renewables – close to 60% of global primary energy by 2050, but down to about 30% by 2100. Global oil demand would peak in 2025 and gas in the 2030s. Gas’ role would be reduced to 12% of primary energy by 2050 and down to 3.5% by 2100, and only if decarbonised. BP’s Outlook shows that by 2040 the world will still need oil and gas to provide at least half of the world’s primary energy, whichever scenario is considered. Even under the RT scenario natural gas provides about 27% of primary energy by 2040. Shell, BP and French Total are investing in emission-reduction projects such as carbon capture and storage. They are also responding to mounting shareholder pressure to implement clean energy targets in their business plans. Shell’s SKY scenario recognises that there is no clear development pathway to the desired outcome of the energy transition, but it offers a plausible strategy to get there. What it also demonstrates is that it will be more effective if governments invest much more in research to bring forward the development of new, clean technologies and make it cheaper for the future. That could be a more effective way to eventually achieve carbon neutrality than just setting up targets that so far are proving to be undeliverable. Even though renewables are growing remarkably fast, according to BP’s Outlook they will only provide about a third of the global energy mix by 2040, even under a rapid energy transition scenario (Figure 1). The world will still need to meet the remaining two-thirds of energy demand using other fuels. The challenge is that outside OECD countries, in Asia and Africa, people and their governments aspire to improve their standard of living. That requires more energy. BP’s Outlook demonstrates this vividly. There is a clear correlation between human progress and energy (Figure 3). The UN’s ‘Human Development Index’ (HDI) suggests that increases in energy consumption up to around 100 Gigajoules (GJ)/head are associated with substantial increases in human development and well-being. Around four in every five people in the world live in countries where average energy consumption is less than 100 GJ per head and about three in four below 50 GJ/head. As a comparison, the average energy used in the US was 198 GJ/head; in Germany, 115 GJ/head; in France, 99 GJ/head; in the UK, 82 GJ/head; in China, 54 GJ/headl in Brazil, 47 GJ/head; in Nigeria, 29 GJ/head; and in India, 20 GJ/head. Bringing the populations of China and India up to levels would mean using about 4bn metric tons of oil equivalent/yr. This corresponds to a 30% more than the total global primary energy consumption of 2017. It is highly unlikely that these countries will sacrifice their economic growth and energy security. Slowing down economic growth could be a step too far for their politicians. In the ET scenario (Figure 1) the world will consume about a third more primary energy by 2040 compared to now, but that will still be leaving about two-thirds of the world’s population living below the 100 GJ threshold (Figure 3). It is difficult to see how forecasts that predict peaking global energy demand before 2050 account for this aspiration of 70% to 80% of the world’s population to see higher living standards. Clearly, the world may need to produce even ‘more energy’ to realise this ambition (Figure 3). According to the Outlook, ensuring that two-thirds of the world’s population achieve this, will require a quarter more primary energy than will be needed in the ET scenario by 2040. How do you tell Asians and Africans to to limit their ambition to achieve prosperity – something which OECD countries already have. Or conversely how does one convince the whole world to change its lifestyle and use much less energy, if this affects living standards? In social surveys last year in Europe and China, reported in NGW, the public appears to be well aware and concerned about climate change. But even though they are willing for money to be spent to offset carbon emissions, they are only prepared to make small lifestyle changes. These will not bring about the unprecedented change IPCC believes is needed. The yellow-vest, ‘gilets jaunes’, movement in France has brought to the fore the dilemma of how to introduce policies that bring long-term benefits to the environment, in an affordable manner acceptable to the population. Clearly, no politician will be able to ignore the social and economic pressures as climate impacts become more severe, but finding the right balance is still a challenge. Rapid and premature change, before new technologies are firmly in place, could have unintended consequences, disrupting global energy supply, pushing prices up and slowing down global economic growth. In the meanwhile, the energy sector has an obligation to ensure enough energy supplies are available for the world. Divestment will put this at risk. A move to tackle emissions should also address this part of the equation. The systemic risk to oil and gas companies is under-investment and inability to meet demand. However, following a major cost-cutting campaign during the last three years, bringing oil and gas project costs down by more than 40%, oil company profitability and investment in new projects have returned. This is helping the oil and gas companies invest in natural gas – and ways to tackle emissions from gas, including methane – as the fuel of the future, while also increasing their investments in clean or cleaner technology. All credible outlooks and forecasts show increasing contribution from natural gas to global energy demand in the period to 2050. Gas is an essential partner to renewables in the transition to a low carbon future. Limiting the development of new gas-fields to support this future demand will put this at risk.